This beginner friendly quilt pattern is easy to assemble. Called Continuous Squares, the quilt is designed with two simple quilt blocks that merge to create a series of squares. All patchwork is cut on the fabric's straight grain, and that means there's no need to handle the stretchy bias edges found in triangles. The quilt's appearance is dependent on your choice of color and contrast among the patchwork. Take a peek at the example on the last page of this pattern to preview a second look with much more contrast between blocks. 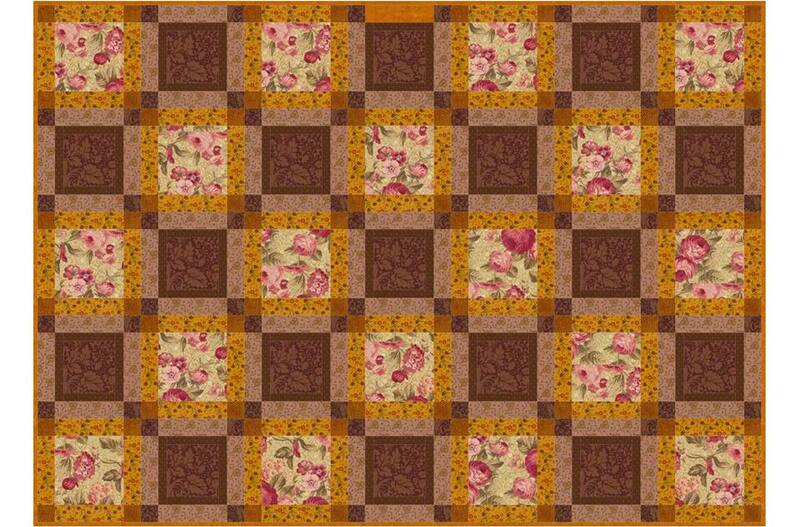 Both of the quilt blocks used in this pattern have large center squares, although one is a bit larger than the other. A narrow frame is sewn around the smaller center square, and the frame provides an opportunity to add one more design element to the quilt. The frame in the example on this page blends somewhat with its center square, but yours can contrast. Wider frames with corner squares surround each block's center section. Four-Patch units emerge when blocks are sewn side by side. Quilt blocks finish at 9" x 9". The quilt finishes at about 45" x 63". Make additional blocks or add a few borders to increase the size of this quilt. We'll use strip piecing techniques to assemble some of the quilt's patchwork. Always begin by cutting just enough fabric to make a test block or two. For this block, begin with the shorter strips listed below. Block A's center square is not framed by narrow strips. Sew a 2" x selvage width framing bar strip lengthwise to one side of a 6-1/2" wide center square strip of the same length. Press seam allowance towards the wider strip. Repeat to sew another 2" x selvage width strip to the opposite side of the wider strip. Press as before. Square up one end of the strip set. Starting with the squared up end, cut as many 6-1/2" segments as possible. If you cannot cut six segments from the length, you may need to use extra yardage (allowed for in totals) to create more units. Repeat to make two more strip sets from the selvage width strips that remain. Cut a total of 18 segments. If your strip sets didn't allow that, sew 2" x 6-1/2" framing bars to opposite sides of 6-1/2" x 6-1/2" squares to make up the difference. Sew a 2" x selvage width corner square fabric to one side of a 6-1/2" x selvage width framing bar fabric. Press seam allowance towards the narrower strip. Repeat, adding another framing strip fabric to the opposite side of the wider strip. Square up one end of the strip set and cut as many 2" segments from it as possible, checking occasionally to make sure the leading edge is still at a 90-degree angle to the bottom edge. Make one more identical strip set and cut more segments until you have accumulated a total of 36. Sew a Set 2 segment to the top and bottom edges of a Set 1 segment. Press seam allowances towards the center. The quilt block should measure 9-1/2" x 9-1/2"
Repeat to make a total of 18 quilt blocks. Block B's center square is framed with narrow bars before the outer (wider) bars are added. Sew a 1-1/4" x selvage width narrow framing strip lengthwise to a 5" wide center square strip of the same length. Repeat to sew a second 1-1/4" strip to the opposite side of the center strip. Press seam allowances towards the center strip. Square up one end of the strip set and cut as many 5" wide segments as possible. Repeat with remaining selvage width (center and narrow framing) strips. Cut as many segments as possible from the two strip sets (probably 16). Sew a 1-1/4" x 5" strip to opposite sides of the 5" x 5" square to create one more unit that looks like segments above. Press as before. Sew a 1-1/4" x 6-1/2" bar to the top and bottom of each Strip Set 3 segment. Press seam allowances either direction. Take care to match all edges carefully and sew with an accurate quarter inch seam allowance. Each framed square should measure 6-1/2" x 6-1/2". Sew a 2" x 6-1/2" outer framing bar to opposite sides of each patchwork square. Press seam allowances towards the new bars. Sew a 2" x selvage width outer framing strip lengthwise to opposite sides of a 6-1/2" wide framing bar strip of the same length. Press seam allowances towards the center strip. Square up one end of the strip set and cut as many 2" segments from it as possible. Create another identical strip set and cut 2" segments until you have a total of 34. Sew a Strip Set 4 segment to the top of the partial block, and another to its bottom. Press seam allowances away from the center. The quilt block should measure 9-1/2" x 9-1/2". Repeat to make a total of 17 type B quilt blocks. Arrange blocks into seven rows, each row with five blocks. Sew quilt blocks in each row together. Press seam allowances towards the A blocks. Join the rows. Press. Mark for quilting if necessary. Sandwich the quilt top with batting and backing. Baste. Trim excess batting and backing, squaring up corners (very) carefully if necessary. Sew mitered doublefold binding to the quilt. This version of the Continuous Squares quilt offers more contrast from block-to-block. The blocks are also arranged in a different layout -- A and B blocks swap positions in the design. If you choose this type of layout, make 18 B blocks and 17 A blocks.